*To those who already sent me cards/letters-THANK YOU! I loved them all so much and they are proudly displayed on my fridge. Unfortunately, the post office here doesn't believe in carrying stamps apparently so I have the letters written, just need to wait for postage to become available! I've officially been in Mosetse over a month! The people here are awesome and friendly and I've had no problems. My house is pretty great, I really wanted to post a picture of a mud hut and try to convince everyone it is my house, but of course, posting a picture takes way more Internet than I will probably have. It's a government issued house and there are hundreds of the exact same house all around my district. I only have one close neighbor, who is the head nurse/supervisor at the clinic. It has four solid walls, a lovely in-tact roof, and doors that almost all close (the important ones close, at least). I have a spare bedroom with absolutely no furniture in it, but my living room have a solid broken couch, chair, and a decent kitchen table. Please keep in mind my standards have drastically plummeted since leaving the US. My kitchen is really great though, tons of storage space, a pantry, working gas oven/stove, and a fridge (but I don't have electricity so I use it for decoration in my living room). I am told "the chief will put light in your house". I'm skeptical. I'm not sure if my house is actually nice or if I'm just so pumped that I actually have my own house for the first time in my life that I'm overlooking many things....like the fact that only half of my doors close. Also, it wouldn't be weird at all if I did indeed live in a mud hut, I'd say about 40% of the village does. There is a lizard living somewhere in my house. What does he eat? Is he in my bag of rice? What if I step on him as I'm walking in the dark to the bathroom at 1am because I'm unable to sleep due to the fact that I'm POURING sweat? Does he want to cuddle? How do I feel about that? I know he's here because I saw him chilling in my pantry and he also scared the living bejesus out of me. I thought it was a snake because I've been told we have those since there is a river running through the village (Which is bone-dry, don't you worry). Anywho, I've named him Reptar and we shall be great friends (and he's definitely a boy because of the way he is). I also killed a scorpion in my bathroom that same day which was horribly traumatic and I was probably a little over-dramatic about the situation, but C'MON PEOPLE IT WAS A SCORPION. This also leads me to believe Reptar is doing a particularly poor job of eating the insects in my house and I'm considering reevaluating his tenant-ship. My friend killed a cockroach in my house the other day and said he felt bad because "I felt like I was taking a life"...BECAUSE THEY ARE MASSIVE. Men in Black style cockroaches. The 'clinic' I work at isn't even really a clinic. It's technically a health post, which means it is very, very small. The staff is two nurses, one health education assistant, one cleaner, and one driver. The best part about this is we don't actually have a vehicle, although I've been told we used to. What does the driver do you ask? NOTHING. 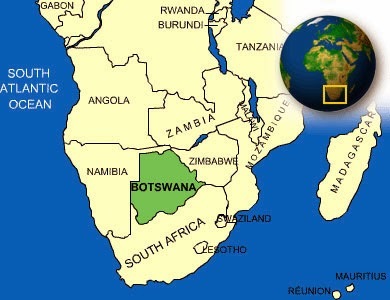 Welcome to Botswana, where nothing makes sense and don't ask why! But the clinic is right next door to my house. It is roughly a 30 second walk but let me tell you, 30 seconds in this sun is enough for me for the entire day. I usually only pull out my umbrella on walks longer than 60 seconds. In the morning the clinic is PACKED with people. There are only two rooms, and one storage room, which I've seen the nurse treat patients in before. Babies are weighed in the morning, rations are distributed, and the nurses see patients all day. Afternoons are very dead and we all just sit in the waiting area, which is basically a covered patio with benches, and talk. By talk I mean they all talk in Setswana and I sit there trying to understand at least one word every 5 minutes. I usually fail and just zone out. The staff is all really awesome though and everyone speaks English, they just prefer Setswana, which makes sense, it is their language. I have also been charging my phone, computer, and light at the clinic. My computer holds little charge so I don't use it very much, I've been able to watch a few movies though. I entertain myself by writing blog posts, reading, rewriting a cookbook by hand so I don't have to use power when using it, and baking! My oven is gas powered, terrifying, and the temperatures are either 'Might As Well Throw This In A Fire' and 'Off'. The bread cooks fast. I also play a fun game called 'How Long Until it Spoils?!' Milk last 2.5 days unrefrigerated until spoiling, by the end of the third day it's chunky. Stay tuned for various vegetable and fruits. Although I barely do anything during the day, I'm exhausted at night. It's similar to that feeling you get after you've been in the library for 12 hours cramming for an exam the next morning, your brain is exhausted. Can you tell I just got out of college? And that I crammed a lot? This weekend my friend and I were literally dragged into a wedding, taken by the shoulders and pushed through the tent. Even though we got there way later than everyone else, they gave us a spot under the tent. They even tried to serve us before the rest of the table, but we refused, which was definitely the right thing to do. We are trying to integrate into this community, not be guests for two years. It was exhausting. I sweat. All. The. Time. If any two parts of my body touch, whew, it is game over, I will sweat in that place. I sleep in snow angel position to try to get air to any place on my body that air will circulate. I often wake up in the middle of the night sweating. I've considered sleeping on the floor to cool off but ever since the scorpion incident, I'm hesitant. I'm going to find a battery powered fan ASAP, but everything takes about 5 times as long as it should in Botswana, so give me a few months. A lot of kids here have told me they've never actually seen a white person, or 'lakgoa' as they call it, in person. And I think that's true for most of the young villagers. The population is about 3,000 and tons of kids everywhere (but no high schoolers, they all go to boarding school in another village). They've only seen a white person on TV, so no pressure or anything. An entire village's perspective on the Lakgoa's and the citizens of the United States is entirely dependent on a 22 year old girl who has no idea what she's doing 90% of the time. Until Saturday, I thought there were only two languages spoken here, which was horrible enough, but now I found out there are three. People here really don't understand how hard it is to learn a second language, because they began learning their second language at the age of 5 and their third and maybe their forth. I am only focusing on learning Setswana, but that angers the Ikalanga people since this is more their region than the Setswana, and the third one is the bushman language (It's a dying language, Carly, get on it) and yeah, never in my life will I learn that. It has all sorts of clicks and noises that I'm simply unable to make with my mouth. Some older people won't even respond to me if I don't greet them in their language, but how in the world am I supposed to tell if they speak Setswana or Ikalanga? Eish. A huge struggle for me is the water. I live close to the salt pan so the water is salty, but the bad part is that it is thick. I have no idea what makes it that way and I haven't heard of anyone else with this issue, but it's horribly unrefreshing, no one in the village drinks it, and my filter is already half clogged. Everyone drinks rain water, or carries their water in from Francistown, I'm still debating on if I want to carry in 80 liters of water a month on a tiny bus.